Thanks for looking ....Enjoy your Day!!!! 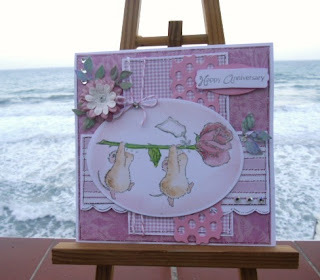 This is just so cute - I think the mice and rose are just lovely! Very pretty design and the mice are so cute. Everything about it is really nice - I really like your flowers too! Love those little meeces Silvie, and your glamour dusted rose os beautiful.Gorgeous card. Big hugs from me and Tills! all your soft colours and layering make for a really romantic anniversary card Sylvie - it's just beautiful! Tee hee .. .. and I have this one Sylvie!!! I really do think our taste in stamps is identical! Love what you have done here very much. Keep up the good works guys I've you guys to my own blogroll. litte more on this topic? I'd be very grateful if you could elaborate a little bit more. Thank you! web I found this web page as a finest web page for most up-to-date updates. which blog platform are you using for this site? I'm getting sick and tired of Wordpress because I've had issues with hackers and I'm looking at alternatives for another platform. I would be fantastic if you could point me in the direction of a good platform. such a excellent informative web site. methods with other folks, be sure to shoot me an email if interested. Hi to all, because I am truly keen of reading this web site's post to be updated regularly. It contains fastidious stuff. to take most recent updates, therefore where can i do it please help. quick visit this web site, it contains precious Information. :-P And, if you are writing on additional online sites, I'd like to follow you. Would you make a list of all of all your social community pages like your linkedin profile, Facebook page or twitter feed?